« WOMEN: SECOND CLASS CITIZENS IN CHRISTIANITY? LONG ON FAITH, SHORT ON FACTS? It has long been a criticism that hardened atheists have leveled at Christianity: faith is put on a pedestal and facts are harder to find than a government surplus. 1. Beyond the four sections of the Bible detailing His life, death and resurrection, the website EveryStudent.com details how two ancient historians, Cornelius Tacitus (A.D. 55-120) and Flavius Josephus (A.D. 38-100+) wrote about Jesus and how He was put to death by Roman authorities. 2. Powerful evidence for Jesus’ resurrection (a central element of the Christian faith) comes from a man named Paul, who spent years persecuting Christians, then became a Christ follower and spread Christianity throughout the Mediterranean. Consider the enormity of that statement: Paul was telling these people that if they didn’t believe him about the resurrection of Jesus, there were all kinds of living witnesses who could back him up. 3. There is also convincing evidence that Jesus is the Son of God. Some critics say Jesus himself never made that claim — it was overzealous followers who “put the words in His mouth” when they wrote the four sections of the Bible about His life. What does accepting Him mean? It means believing that His sacrificial death makes up for all the wrong things we’ve done and all the right things we’ve failed to do. So God no longer sees any of that. He sees us like He sees His son – perfect in every way. And through that, we are welcomed to spend eternity with Jesus in Heaven. Does this make sense to you? Yes or no, share your thoughts below and let’s have a conversation. 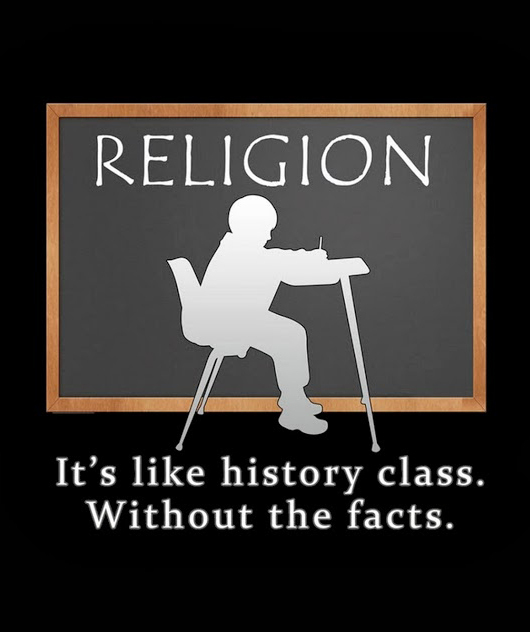 All civilizations grew up around religion. Atheist regimes on the other hand are genocidal and oppressive. That all civilizations have grown up around religion and that civilization disintegrates when religion is forsaken, proves that great good of religion and the great evil of atheism. Thanks for your comment, even though I don’t necessarily agree with your sweeping generalizations. There are lots of mature, respectful atheist people out there who are trying to do their best as human beings. I didn’t make any generalizations. All civilizations degenerate when they forsake their religion. This has happened over and over and over again making it nothing short of obvious. If you haven’t read it, a great book concerning the facts about Jesus is “The Case for Christ” by Lee Strobel. Can’t recommend this one enough! 1) Josephus and Tacitus documented beliefs of contemporary Christians. Neither was affirming the historicity of Jesus. 2) Paul was not an eye-witness, and none of the people he claims witnessed the resurrection every spoke of it. He does not represent powerful evidence for the resurrection. 3) The Jewish leaders had many reasons to crucify Jesus, and claiming to be the Son Of God is not the only form of blasphemy. It is a fact that there is not record of Jesus ever claiming divinity. silenceofmind: It is not a fact that all civilizations degenerate when they forsake their religion. It is a fact that there is a correlation between how religious a society is and how violent, unhappy, unhealthy, and uneducated they are. The greatest examples of civilizations degenerating after they forsake their religion are Rome and Western Civilization. Atheism is such a terrible malignancy because atheists view the degeneration as progress. Atheism then, is the faith of the modern barbarian. All civilizations/societies arc and decline over time. If you look, most of them were religious. What I supplied for you are facts, easily confirmed, that Secular Humanist societies are superior to religious societies across many factors. Also, “Western Civilization” (whatever that encompasses) has not “declined”. We are happier, more prosperous, less violent, and more peaceful as a species now than we have ever been in the history of mankind, and this is largely due to scientific progress achieved by Western civilizations. Atheists believe that everything happens all by itself. You demonstrate that with your cavalier claim that since all civilizations arc and decline over time. You just accept your claim without thought or reason. Since all civilizations grow up around religion it makes perfect sense that what powers the arc of ascent and decline is religion. Virtue is key to civilization. The decline of virtue is was powers civil decline. This fact has been known sense the time of the ancient Greeks 2500 years ago. I would say you view progress as degeneration. By most standards, we are healthier and happier and less violent and more peaceful than ever before. It takes a warped mind not to consider that to be progress. You need to stop saying things like “Atheists believe this”, and “Atheists believe that”. Atheism is merely a disbelief in God. Individual atheists may hold a variety of different worldviews. It would be like me saying “Theists believe that sacrificing babies on a stone alter will bring good crops.” It is true of some theists, but has no value in a discussion comparing worldviews. OK…skipping over the fact that you just stated that religion powers the decline of civilizations, your statement is not logically valid. It assumes causation from correlation. All civilizations grow up around the availability of natural resources, and all civilizations change the environments in which they exist. These facts make much more sensible candidates for a causal relationship with the duration of historical civilizations. So no, it does not make sense that religion powers civilization. In fact, its much more plausible that religions reflect civilizations rather than vice verse. Religions do not teach virtue. They demand blind and unquestioning adherence to dogma. The abdication of one’s responsibility to continually question what is right and what is wrong is not virtuous. Almost all atheists are leftists. And the uniformity of atheist thought indicates an intense indoctrination and brainwashing into leftist ideology. For example, almost all atheists believe in the global warming hoax. Almost all atheists believe that everything happened all by itself. Almost all atheists believe the hoax of overpopulation. Almost all atheists hate the Catholic Church. Almost all atheists think that religion is destructive when the fact is exactly the opposite. Almost all atheists believe that government is a tool for social justice when the exact opposite has been proven time and again. Atheists appear to have been created in robot-driven factories their uniformity of thought is so exact. Doubtful, but what is a “leftist”? I would say a majority of atheists hold liberal social attitudes, but very few would support a communist style of government or even a highly socialist government. Many atheists are conservatives. But exactly what point are you trying to make with these broad generalizations? They certainly don’t refute anything I said earlier. 90% of black Americans vote Democrat. 70% of black American babies are born bastards. Consequently it is not racist to make generalizations based on vast majority behavior. In fact, most atheists are Marxists. I’ve never met an atheist who wasn’t. The uniformity of beliefs and modes of thought make generalizing about atheists safe and true. Yes, that would be a racist generalization to make. The majority of theists do not believe that Jesus Christ rose from the dead, so would it be valid for me to say “theists don’t believe in the resurrection”? In fact, most atheists are not Marxists. Yes, unless you have spent your life in a commune (and not a religious commune) then you have met many atheists who are not Marxists. Atheists are far from uniformist in their beliefs. If you think they are, then you have not been paying attention to the great deal of arguing that has been going on in the atheist community over the past two years. You still have not addressed my points about religion and civilization. It seems your arguments rely solely on gross incorrect generalizations and unsupported assertions. You would be better off forming your opinions based upon facts and reason. I know that atheists are put through an indoctrination factory because I’ve never met an atheist who thought differently from any other. That there is diversity among theists is a strength, not a weakness. Diversity demonstrates freedom of will and freedom of thought. Atheists have none of that. Again, if all you have to support your beliefs are demonstrably incorrect generalizations, then you have a very weak position. Let me know when you have a logical argument based on evidence. Statement such as “atheists are put through an indoctrination factory” are simply to silly to merit a rebuttal, and your obvious foolishness does more to discredit you and your beliefs than anything I could put into a post. So by all means, keep talking and keep posting and make sure there is no doubt that you are a Christian. 1. What experts can *prove* that Josephus and Tacitus weren’t affirming the historicity of Jesus? 2. How do you know that “none of the people Paul claims witnessed the resurrection ever spoke of it”? Did you travel back in time and check them all out? 3. Just because there were other forms of blasphemy absolutely does NOT disqualify the seriousness of Jesus’ claim, nor the reaction by religious leaders of the day. 1. Neither is claiming first hand knowledge, and when a credible historian repeats information from a prior source they cite it. Because of this, theists have the burden of proof to show that either of these individuals is quoting a credible source. 2. OK, we HAVE NO RECORD of any of those witnesses ever mentioning it. Which means either they did not think that a body rising from the dead was worth documenting, or later historians did not think multiple eye-witness accounts of a body rising from the dead was worth retaining, or….wait for it…the event never happened and Paul made it up. Which of those three explanations is more credible? 3. But it does disqualify “Claiming to be God” as a necessary indictment for blasphemy, leaving you once again with no record of Jesus ever claiming to be the Son Of God. 1. So, my question remains unanswered. 2. We’re going back 2,000 years. How many records from that time still exist?? How convenient that you can use that as an excuse to denigrate something that DID survive from that time. 3. No, it most certainly does NOT disqualify claiming to be God as an indictment for blasphemy. Where would you get such a bizarre thought? On top of what I’ve just written, please keep in mind that while everyone is welcome to enjoy Frank’s Cottage, the content is written for people who are open to faith. 1. You have made the positive claim that they were affirming the historicity of Jesus. You have the burden of proof to support that claim. What experts can *prove* that Josephus and Tacitus were affirming the historicity of Jesus? So, my question remains unanswered. 2. Apparently no records of Jesus survived from the time of his supposed existence. That is my point. You claimed that Paul’s writing was evidence of the veracity of the New Testament. One would expect that other documentation of the events he describe would have survived, much as his letters did. But none did. That means his claims that there was widespread knowledge of Jesus’ resurrection are not credible. 3. I said it disqualifies “Claiming to be God” as a NECESSARY indictment for blasphemy. Thus, his indictment for blasphemy does not prove that he claimed to be the Son Of God. Other blasphemous statements would have sufficed, as well as myriad non-blasphemous actions. Please read my responses with the same care I put into writing them. 1. I can’t prove they were. You can’t prove they weren’t. So you go with your atheist point of view, I’ll go with mine. 2. I have not made the positive claim. St. Paul does. Maybe you think he was lying about 500 people still alive in his time who saw Jesus. I don’t. 3. So what if other blasphemous statements would have sufficed? That proves absolutely nothing. Again, this website is not meant for people with no spirituality. So no need to end with carefully crafted insults. Indeed, you have had a lot of time and space to make your points and you’ve done so. Therefore, your time for debating (and it’s not a conversation you’re having…it’s a debate you want to win) is finished.